Location of Pocahontas in Randolph County, Arkansas. This city was named after the Native American from Jamestown, Virginia. A statue of her is located in Overlook Park along the Black River. The family of Dr. Ransom S. Bettis is given the credit for being the first settlers on the land now called Pocahontas. Dr. Bettis' daughter, Cinderella, married Thomas S. Drew, and lived on 800 acres where the town of Biggers now exists. Bettis and Drew led the founding of Pocahontas as the county seat of Randolph County. Randolph County is famous for many "firsts"; Arkansas' oldest town, Davidsonville, was established in 1815. 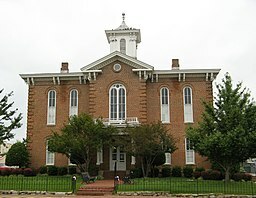 The first Arkansas post office was built in Davidsonville in 1817, and the first state courthouse was established in 1818. The earliest land claim was in 1809 near what is now Ravenden Springs. The first actual term of court convened in Arkansas was in 1815 in a part of Lawrence County that was given over to Randolph County. And the country's first overland route, the Natchitoches Trail, went through parts of Randolph County. In 1835, the Territorial Legislature granted the formation of Randolph County from part of the area then called Lawrence County. The county was named after John Randolph, who was one of the first settlers in the area. Randolph County encompasses the rolling hills of the Ozarks to the west and rich, flat farmland of the Mississippi Delta to the east. Five rivers flow through the county, providing access to fishing and canoeing. Soybeans, rice, and other grains are the principal crops in the Delta region, while cattle ranching dominates the hill country. The poultry industry is also a vital part of the area economy. The industrial base is diversified, with products such as shoes, large truck trailers, technical components for communications, picture frames, golf bags and luggage, tool boxes, wood products and more. Pocahontas is the county seat with a population of 6,616. The other 10,407 residents of Randolph County live in rural areas and five incorporated communities - Maynard, Biggers, Reyno, Ravenden Springs and O'Kean. Local legend holds that Pocahontas was named the county seat through an act of trickery. Supposedly, at the county meeting to determine which city would receive the title, the delegation from Pocahontas brought in large quantities of alcohol and distributed them to the other delegations. When the time came to vote, the only delegation not passed out or otherwise influenced was that from Pocahontas. Pocahontas is located at 36°15′49″N 90°58′24″W﻿ / ﻿36.26361°N 90.97333°W﻿ / 36.26361; -90.97333 (36.263560, -90.973349). According to the United States Census Bureau, the city has a total area of 7.6 sq mi (20 km2), of which 7.3 sq mi (19 km2) is land and 0.2 square miles (0.52 km2) (2.78%) is water. The climate is of the city is characterized by relatively high temperatures and evenly distributed precipitation throughout the year. The Köppen climate classification subtype for this climate is "Cfa" (humid subtropical climate). As of the census of 2000, 6,518 people, 2,693 households, and 1,742 families resided in the city. The population density was 886.6 people per square mile (342.4/km²). The 2,924 housing units averaged a density of 397.7 per square mile (153.6/km²). The racial makeup of the city was 97.27% Caucasian, 1.10% African American, 0.44% Native American, 0.08% Asian, 0.20% from other races, and 0.91% from two or more races, with about 0.89% of the population Hispanic or Latino of any race. Of the 2,693 households, 30.0% had children under the age of 18 living with them, 48.0% were married couples living together, 13.1% had a female householder with no husband present, and 35.3% were not families. Around 31.9% of all households were made up of individuals, and 17.3% had someone living alone who was 65 years of age or older. The average household size was 2.32 and the average family size was 2.94. In the city, the population was distributed as 23.7% under the age of 18, 9.7% from 18 to 24, 25.5% from 25 to 44, 20.1% from 45 to 64, and 21.0% who were 65 years of age or older. The median age was 38 years. For every 100 females, there were 84.6 males. For every 100 females age 18 and over, there were 78.5 males. The median income for a household in the city was $24,450, and for a family was $29,525. Males had a median income of $26,382 versus $18,750 for females. The per capita income for the city was $15,529. About 15.6% of families and 18.8% of the population were below the poverty line, including 24.9% of those under age 18 and 16.5% of those age 65 or over. Pocahontas is home to the Pocahontas School District. Public schools include Alma Spikes Elementary School, M. D. Williams Intermediate School, Pocahontas Junior High School, and Pocahontas High School. Pocahontas' school mascot is the Redskins. Pocahontas is also home to St. Paul Elementary School, a private Catholic school serving pre-kindergarten through sixth grade. St Paul's mascot is the Sabers. Pocahontas is the home of Black River Technical College. The Pocahontas Star Herald is published weekly, on Thursdays. It began publication in 1880, and is owned by Corning Publishing. Pocahontas is home to KPOC/KRLW/KIYS radio stations. The stations' "better known names" are: KPOC-FM is better known as Lite 104.1 FM; KPOC is News Sports Talk 1420 AM; KIYS is Country 106.3 FM; and KRLW is Oldies 1320 AM. While the KRLW and KIYS radio stations are broadcast centrally to the Walnut Ridge/Hoxie area (a community some 15 miles away), the broadcasting site and main offices are centered with KPOC inside Pocahontas. The stations are operated by Combined Media Group Inc.
A 17-block area of downtown Pocahontas has been designated a National Historic Landmark District. Pocahontas is also a Preserve America Community, and is home to the Imperial Dinner Theatre, the Studio for the Arts and the Downtown Playhouse. Larry P. Arnn, a Pocahontas native, president of Hillsdale College, Hillsdale, Mich. Co-founder of Claremont Institute, Claremont, California, he served as its president from its founding in 1985 until his appointment as Hillsdale president in 2000. While studying at Oxford University, Arnn served as director of research for Sir Martin Gilbert, the official biographer of Winston Churchill. Edwin Bethune, a former member of the United States House of Representatives, graduated from Pocahontas High School, but left the community in 1972. He was elected to Congress from the Second Congressional District in Arkansas (Randolph County falls under the First District). Drew Bowers, Arkansas Republican politician and lawyer, was born near Pocahontas in 1886. Billy Lee Riley, Pocahontas native, was an American rockabilly musician, singer, record producer and songwriter. Jim Johnston, former composer for World Wrestling Entertainment/WWE Music Group. Wear Schoonover, Pocahontas native, was the first University of Arkansas athlete in any sport named to an All-American team. Schoonover starred as a wide receiver for the Razorbacks in 1927-1929. He was named All-American in 1929, and was named to the College Football Hall of Fame in 1967. All-Southwest Conference in basketball, he also excelled at college baseball and track and field, and achieved the highest GPA of any Arkansas athlete through the 1980s. His name is reflected in the name of the local high school basketball court (Schoonover Fieldhouse), as well as the high school football field (Schoonover Stadium). Linda Collins-Smith, Republican member of the Arkansas Senate and owner of Days Inn in Pocahontas. Edward J. Steimel, Louisiana political activist and researcher, was born in Pocahontas in 1922. Michael Jason Allen actor, director, writer, singer, musician was born in Pocahontas in 1974. ^ "Annual Estimates of the Population for All Incorporated Places in Arkansas" (CSV). 2005 Population Estimates. U.S. Census Bureau, Population Division. June 21, 2006. Retrieved November 16, 2006. ^ "Weatherbase.com". Weatherbase. 2013. Retrieved on August 6, 2013. This page was last edited on 11 March 2019, at 01:07 (UTC).